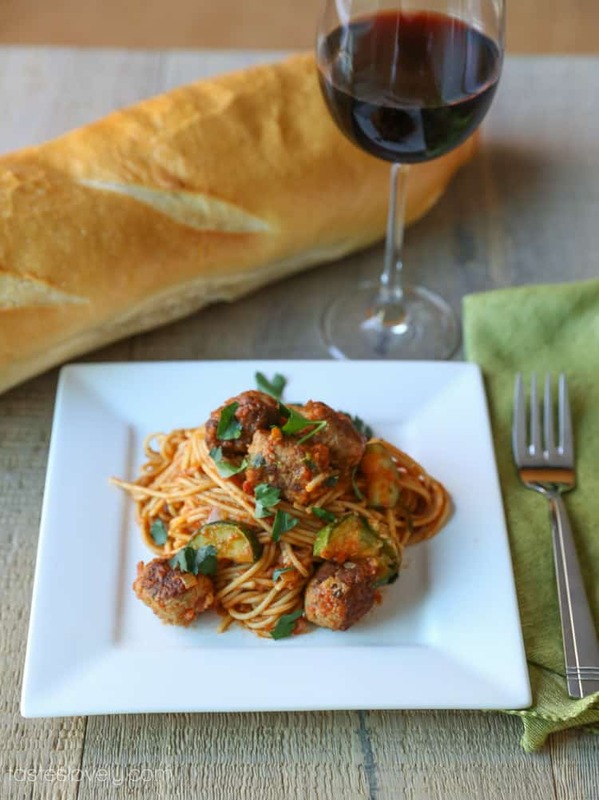 Is there anything more classic than spaghetti and meatballs? It was always good news when you would ask your mom what’s for dinner and she would respond, “Spaghetti and meatballs.” Yesssss! What’s not to love? But that’s what so great about this recipe. I make the tastiest and easiest “meatballs” by just rolling Italian sausage meat into little balls and browning them in the pan. In 5 minutes I can roll out and have 25 meatballs. Win! I’ve solved that problem for you too. 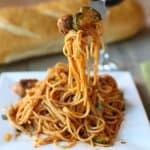 This skinny spaghetti and meatball recipe uses lean Italian sausage, much healthier than ground beef, along with adding in zucchini for extra nutrition and swapping in whole wheat pasta instead of white pasta. Each serving is only 410 calories, double win! So you can eat a big plate of this spaghetti without worrying about your skinny jeans getting a little too snug. Just like in the good ole high school days. Heck, you can even listen to the new Britney Spears CD while you’re cooking it and it will really feel like high school all over again. You girls bought and listened to Britney’s new CD the day it came out too, right? What am I saying, of course you did. You’re probably listening to it right now like me. Oh Britney, I will always love everything you put out. Don’t forget to top it with some parmesan. Or a lot of parmesan. Always a lot of parmesan. 1. Bring a large pot filled with water and a huge pinch of salt to boil over high heat, and heat a large flat bottom skillet with 1 teaspoon olive oil over medium high heat. 2. While the pan is heating up, remove the sausages from their casings. 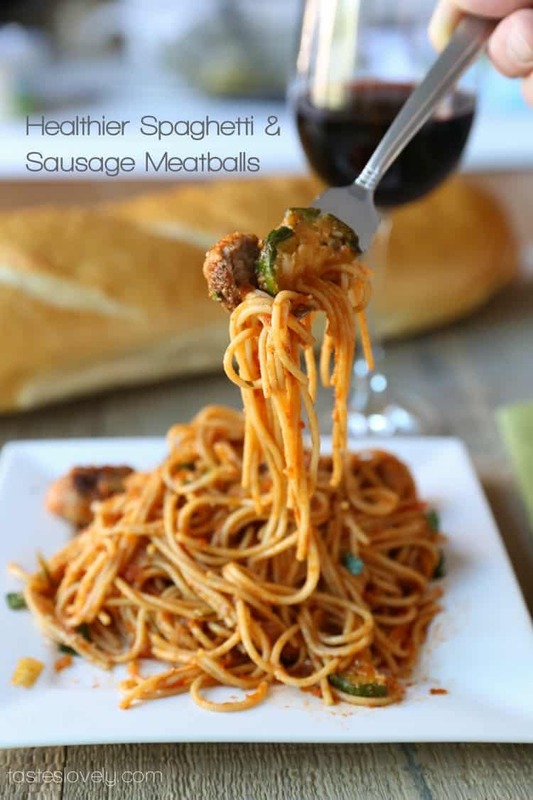 Cut each sausage link into 5 pieces and roll them into balls. Add the sausages to the heated skillet, cooking until they’re browned on all sides, about 5 minutes. 3. The water should be boiling at this point. Cook the pound of whole wheat pasta according to package instructions. 4. 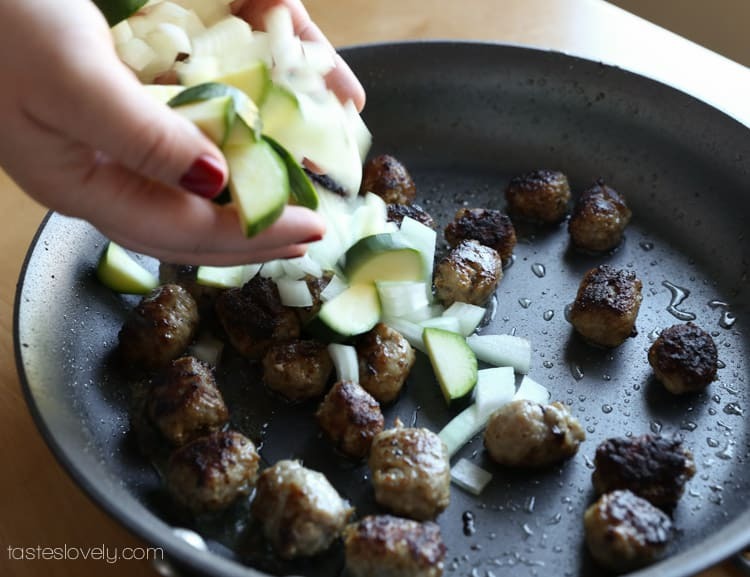 Add the zucchini and onion to the skillet, salt and pepper, and cook with the meatballs until the onions become translucent and the meatballs are cooked through, another 5 minutes. 5. Add in the garlic and cook until fragrant, about 30 seconds. 6. Pour in the marinara sauce, reduce heat to low, and continue cooking until the pasta is cooked through. 7. 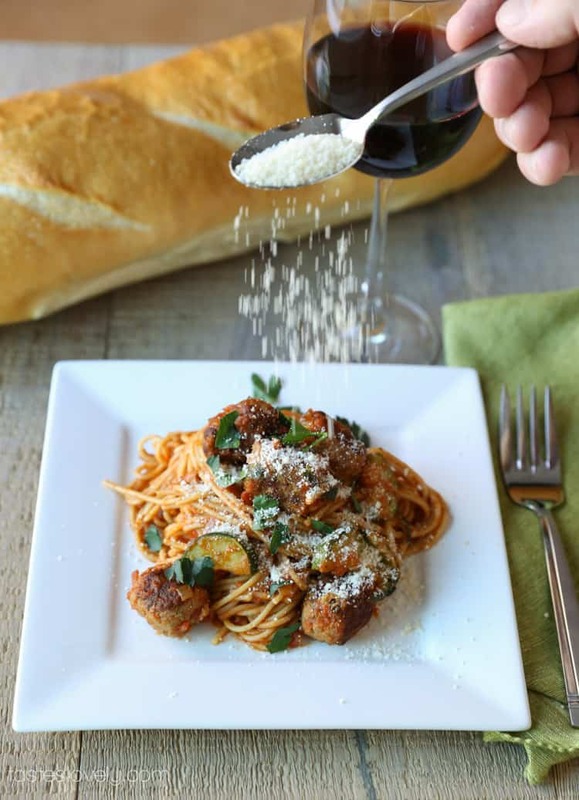 Drain the pasta and toss with the meatball and vegetable marinara sauce. Serve immediately. 8. Will keep in an airtight container for up to 1 week in the fridge. the last picture is making me want some spaghetti reaaaaal bad. Mom I love a big plate of spaghetti and meatballs ! I’m drooling over your healthier version! Haha! This just made me laugh out loud! I can be your mom Taylor, and I’ll make you lots and lots of spaghetti : ) Just kidding! Auto correct is the best & worst at the same time. But seriously, thanks for the comment! YUM! Sounds great for a chilly night! And that first photo is a stunner! Well now… this just looks divine!!!! I need soon. Love how easy this is, Natalie! Great idea for when I am craving pasta, but want a healthy meal. Thanks for the recipe! This needs to be our dinner table over the weekend! I love a big plate full of spaghetti and meatballs! Thanks Sarah! Winter is the best time for comfort food. Natalie, your pictures are gorgeous! They make me want to dive through the screen and take a bite (or two). 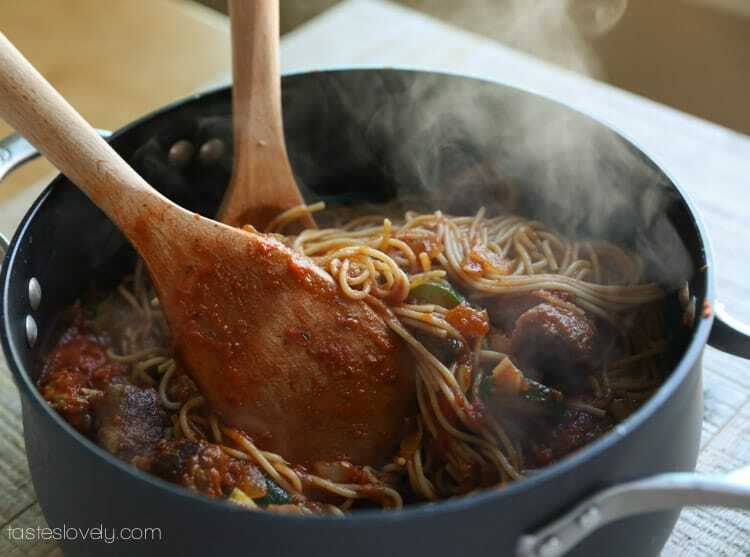 This spaghetti would make a great weekend dish. Thanks for sharing! Thanks Ashley! You’re so sweet. Too bad “Wonkavision” from Willy Wonka isn’t real yet, then we could just reach in to our computers and eat all the yummy food. Haha! Omg, love this recipe and your pictures! Makes me want this for dinner tonight but I’m missing sausage. :( Definitely need to try this. Pinning to make! Need all the healthy meals I can get to help counteract all those holiday cookies! Thanks Tina! Oh my, I have been baking way too much too! Should probably switch to more salads, but I’d rather eat pasta. Ha! You make want to eat spaghetti and I’m not even a spaghetti fan. Brilliant beautiful photos! Hello mates, fastidious post and fastidious arguments commented here, I am actually enjoying by these. Thiss paragraph will help the internet users for creating neww weblog orr even a blog from start to end.